Apple supplier Pegatron, which may have been tapped to work on Apple's next generation iPhone 5S, the budget iPhone and possibly even the iWatch, is under fire from the China Labor Watch. The group is accusing it of labor abuses, according to a report from The Wall Street Journal, and is concerned about working conditions that may be unsafe and in violation of environmental regulations. Workers are also apparently not being granted pay in some cases, or may not be receiving the proper paperwork that would enable them to work in other facilities or for other companies. "Indeed, a number of Apple's social responsibility promises are being broken, including those related to worker safety, protecting the environment, and more," China Labor Watch said in its report. "None of the Pegatron factories investigated here, for example, provide sufficient safety training to workers. At Riteng and AVY, waste water is disposed of directly into the sewage system, polluting the local water source. Apple has zero tolerance for lapses in the quality of its products. If a quality issue arises, Apple will do everything it can to have it corrected immediately. But a lower level of urgency apparently applies in responding to labor rights abuses. Despite its professed high standards for the treatment of Apple workers, serious labor violations have persisted year after year." 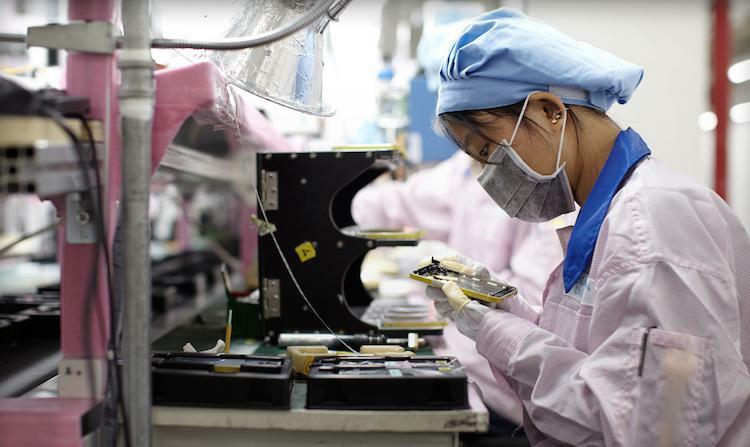 Apple responded to the China Labor Watch report Monday morning. "Apple is committed to providing safe and fair working conditions throughout our supply chain," the company explained. "Apple is the first and only technology company to be admitted to the Fair Labor Association, and we are dedicated to protecting every worker in our supply chain." Apple said that Pegatron employees typically work about 46 hours per week and that overtime isn't viewed as beneficial to the company. In fact, it says it works with suppliers such as Pegratron to prevent any overtime work and that it regularly performs audits to check up on conditions. "Their latest report contains claims that are new to us and we will investigate them immediately," Apple said, noting that investigators will soon check in on AVY, RiTeng and Pegratron to make sure that employees are receiving full pay and are being treated well. If they aren't receiving pay, Apple will make sure Pegatron pays in full. The China Labor Watch gathered its information between March and July of this year from three Pegratron factories in undercover operations. It conducted more than 200 interviews. The group recently found that Samsung's suppliers were employing underage workers.